The scalp keeps renewing at the cellular level. In the case of psoriasis, this cycle is 10 times faster than usual. The new cells pile up in thick flakes covered in white and dry scales. Constant itching and red patches around the face are both physically and mentally challenging which only exacerbates the symptoms. 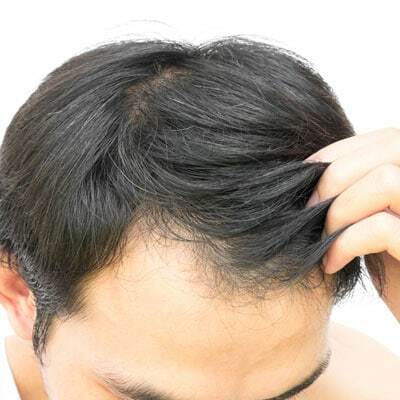 This condition may extend to other areas of the body, but because the hair keeps the scale from falling off this is where it is the thickest and most inconvenient. To this day there is no cure for psoriasis, but some products can bring significant relief from the unpleasant side effects such as the itching and the dryness. Help with scaly plaques? It’s here! 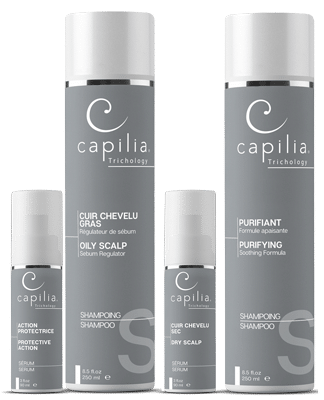 Products from the Capilia Advanced Scalp Care Line are made with 100% natural ingredients including arnica, St John’s Wort, linden, witch hazel and Brazilian jujube. Their purifying and hydrating action has been specifically developed for skin affected by psoriasis. For intense cases, alternate between the specific Purifier and Dry Scalp Shampoos in combination with the Protective Action Lotion from the Capilia Advanced Scalp Care Line. For mild cases, alternate the Dry Scales and Dry Scalp Shampoos in combination with the Protective Action Lotion from the Advanced Scalp Care Line. Note that your personal HOME CARE ROUTINE may differ. Ask your certified Head First hair and scalp specialist for a personal consultation. *Stock image.